Study for a qualification in ITIL Managing Across the Lifecycle (MALC) by taking an online training course from 4PA! The ITIL Managing Across the Lifecycle Certificate has become the IT industry’s de-facto intermediate professional qualification in the field of IT Service Management. Why Study ITIL MALC with 4PA? This eLearning course contains all the learning materials you need in order to prepare for the ITIL Managing Across the Lifecycle exam. Our course has been accredited by PeopleCert, who are licensed by AXELOS as an Examination Institute for the ITIL® Managing Across the Lifecycle Certificate in IT Service Management. In addition to the resources provided, the examination guidance recommends that candidates should complete at least 30 hours of personal study. This module represents a brief re-cap of key concepts in the ITIL service lifecycle, looked at from a strategic and managerial perspective, as an introduction and foundation for the rest of the syllabus. This module covers the value of good communication and ensuring its flow across the service lifecycle. It also addresses the effective co-ordination of interaction with both the business and suppliers as key stakeholders. 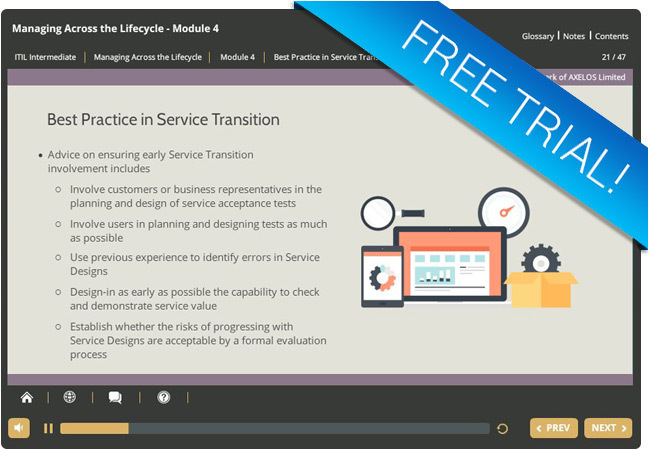 This module looks at how Service Strategy influences other lifecycle stages, how Service Design should be carried out with the lifecycle in mind and the importance of ensuring that the Service Management process interfaces, inputs and outputs are integrated across the lifecycle. This module takes a high-level, holistic view of service management, from the perspective of managing services and service components through the service lifecycle. It focuses on capturing customer and stakeholder needs, measuring service value to ensure that needs are met, and balancing potential conflicts and competing issues with regards to challenges, critical success factors and risks. This module covers governance and the organizational structure, the skills required and the service provider types. This module focuses on the types of measurements that can be used to support the monitoring of service management activities and IT services throughout the service lifecycle. This module covers implementing, assessing and improving Service Management. It covers key considerations for the implementation and improvement of both the Service Management practice and the services themselves, as well as key considerations when planning and implementing Service Management technologies. Thinking of sitting the ITIL Managing Across the Lifecycle Exam? On this page, you will find everything you need to know! In order to achieve this ITIL Intermediate qualification, you must pass the ITIL® Managing Across the Lifecycle Certificate in IT Service Management exam. To pass the exam you must get 35 out of 50 questions correct, or 70% and If successful, delegates will gain 5 credits towards ITIL Expert level. The course materials provided in the Managing Across the Lifecycle eLearning course will provide you with all the information you need for this exam. Why not try out a free trial module from our ITIL Managing Across the Lifecycle eLearning course! In this ITIL Intermediate trial module, you will learn how to build service management capabilities in order that services flow through the Service Lifecycle. It includes interfaces between key processes and lifecycle stages. Like the full ITIL Managing Across the Lifecycle (MALC) eLearning course, you can access this free trial module from any device whether you are at home, at work, or on the move!